Garden Club next week and Shop Hop starts! Garden Club is next Tuesday, November 13 at 10 AM or 6 PM OR Wednesday, November 14 at 10 AM. 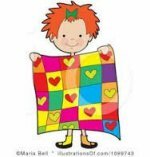 We will be starting our new project, Suzie's Row Quilt. Remember, there is no need to call ahead to reserve a spot, just show up! Cost is just $25 for the year or $3 per meeting. Don't forget your Show N' Tell! Giddy Up and stop in the store to see what I brought home from Quilt Market! There was no horsin around in Houston, just all business! Well, not really, but I do have a few tails to tell you! As I was galloping through the quilt displays to get to the market side of the convention center, these quilted leather saddles stopped me in my horse tracks. They were unbelievable! Don't forget, the Northern Illinois Shop Hop starts Friday, Nov. 9th and runs through Saturday, November 17th. Get your passports here at Quilter's Garden. For more information, CLICK HERE! Our elf has been busy and we have some new applique towel kits. Stop in and check them out!